Sandals Resorts International rolled out the red carpet for its top travel agency partners from the United States, Canada and the United Kingdom, at its 10th annual Sandals Travel Agent Recognition (STAR) Awards Saturday night at the newly renovated Sandals Grande Riviera.The STAR Awards recognize travel agencies and individual travel agents who have excelled in sales and customer service. 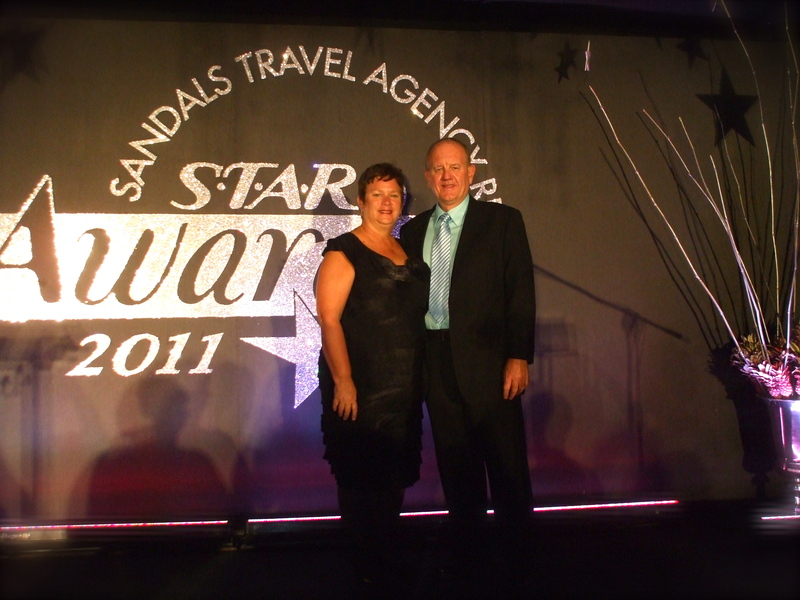 The Sandals Lady was invited to the STAR awards for the 3rd consecutive year and received the honor of being named Best of the Best Sandals Agency. Sandals Chairman, Gordon 'Butch' Stewart credited the success of his hotel chain, which also includes Beaches, Royal Plantation and Grand Pineapple, to the hard working travel partners. In his message to the travel partners, he said he was proud of the resorts, pointing out that they keep getting better and better. "We have had the most amazing love affair with the travel agents throughout the world, North America, UK, Europe," he said. "Our love affair with the travel agents is 30 years old and going strong. We are grateful for all you do for us and all we have achieved together," Stewart said. Stewart and Sandals prefer that travelers visiting the resorts book their package through a Sandals-trained travel agent. Sandals employees admit that the majority of complaints of travelers to the resorts stem from resort selection. Booking through a preferred Sandals or Beaches agency ensures that travelers will be assisted in selecting one of the 13 Sandals resorts or the 4 Beaches resorts by a highly trained, esperienced travel agent. The Sandals Ladies have personally visited each of the resorts and we spend a few weeks each year on the properties to be sure that we have the most up-to-date information to help you select the perfect resort for your vacation. We are honored to be named a Best of the Best Sandals Agency, and we thank our many fabulous clients who have made this award possible. We look forward to helping you plan your next unforgettable vacation!